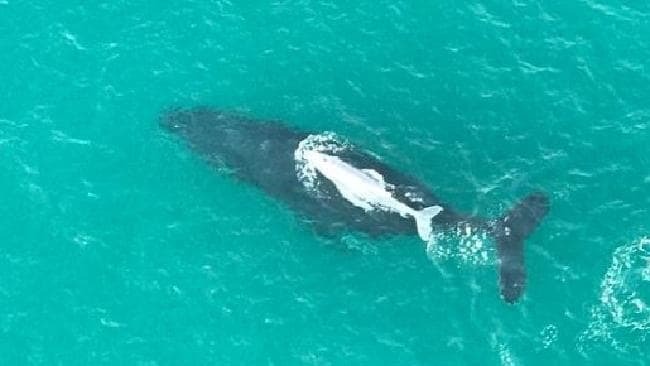 Heads up whale lovers, during its migration toward the Gold Coast, a baby white whale was spotted with its mother. Could this be a child of our favorite white whale, Migaloo? Sadly, it is not. The hope that Migaloo had an offspring just like him was denied quickly when Oskar Peterson, a white whale researcher, confirmed that it is not uncommon for a whale to be born all white. “Over the past 10 years we have sighted and captured on film three other small white humpbacks and have never seen them again,” he said. The young white humpback whale was spotted by Kynan Wall, a Ballina paraglider, a few days ago off Lennox Head. It is due to pass the Gold Coast in the next few days on its way to the warmer north Queensland waters.